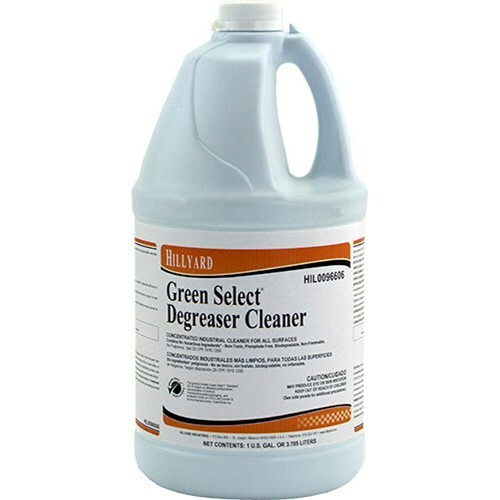 Green Select Degreaser Cleaner is formulated to be non toxic, phosphate free, biodegradable, and nonflammable, and contains no dyes, fragrances, or hazardous ingredients. Green Select products are formulated to minimize the impact on the environment, reduce the risk to human health, and at the same time improve worker safety. Green Select Degreaser Cleaner will clean walls, kitchen floors, resilient tile, tables, and machinery and removes tough, greasy soil from any surface not harmed by water. Better cleaning efficiency is achieved by using a unique combination of environmentally preferred surfactants. Dilution rate 2 oz per gallon.